7 sanity-saving products that make tiny homes infinitely more livable. It's been just over a month since we've moved aboard full time and we're settling into the swing of things. People keep asking me whether Jon, my husband, and I are ready to kill each other yet. But we've lived in fairly small spaces for awhile now, particularly after a year in downtown Manhattan, where we had even less storage and counter space in the kitchen. We're no stranger to making do with the square footage we've got. But there are a few things that we've collected along the way that consistently make our small spaces more lovely and comfortable, that may also have a place in your home, little or not. 1. 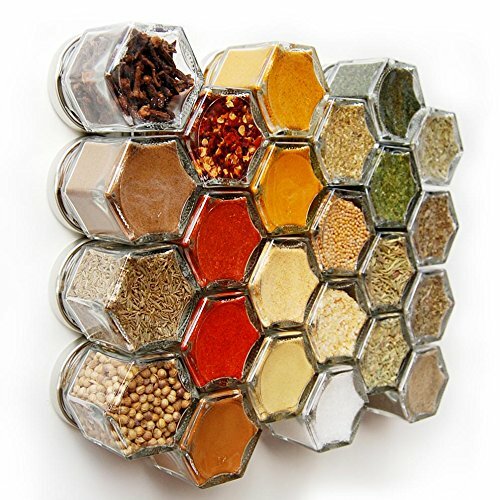 A beautiful magnetic spice rack. I love to cook but have realized over time that it's not the size of my kitchen that matters, it's the ease of pulling things out and putting them away that will make or break my joy of creating a meal. I get frustrated REALLY quickly when things start falling on top of me or out of cupboards as I'm searching for something to add as a meal simmers or bakes. We received one of these as a gift for the tiny kitchen in our New York apartment and it was the most complimented thing in our house. When we moved to the boat, we adapted the spice set with a sheet of metal tooled perfectly to serve as a backsplash behind our sink. It's functional, pretty, and even my wilder spices are at hand at all times. Protip: If you want to make your own magnetic board to fit your space or have spices ready at hand, just buy the empty jars from Gneiss and DIY your own set -- but don't bother making the set from scratch, it's not worth buying all the parts separately unless you want to do it in bulk. 2. 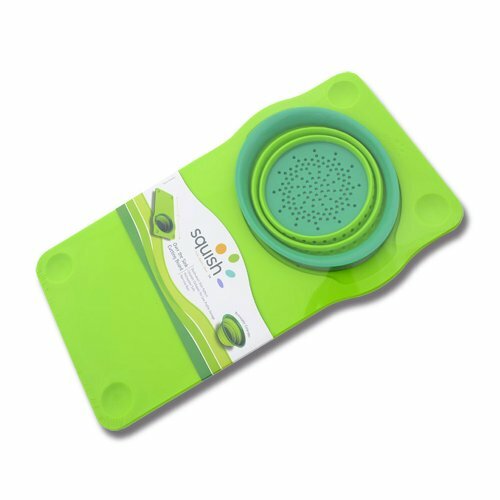 A super smart cutting board and colander. I found this on a tiny house article awhile ago and ordered it out of curiosity. I've loved it ever since. The colander is the perfect size for almost anything you have to wash for two people and takes up no space to store. And the board, while annoyingly awkward to wash, legitimately turns your sink into a real counter space. You can use the colander to catch scraps or hold food as you chop and it still allows you easy access to the sink if you need it. It's doubled my workspace for cooking and other counter needs in both our old apartment and our boat. 3. A safe, romantic lantern. This little guy, dubbed the Candelier, is a new addition to the boat and so far we're really digging it. We were in need of some kind of lantern that didn't run off electricity and the beautiful old brass ones are out of our price range. I was afraid of candles getting knocked over and burning the place up. 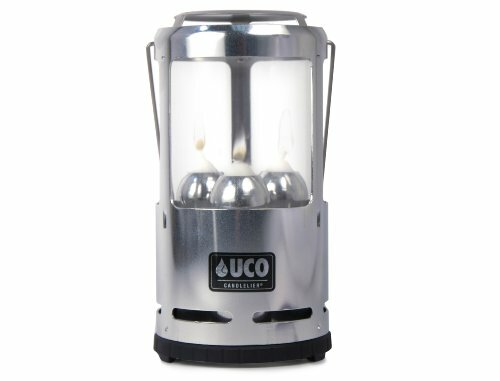 But the Uco has spring-loaded, drip-free candles that burn for 9 hours and are surrounded by a protective, windproof case. The lanterns come in different colors and even smaller sizes and cast a bright but romantic light. And the top can serve as a warmer for your coffee, which I haven't tried but nonetheless seems like a win. 4. A tiny, delightful fireplace. This was originally a boat-warming gift from my supportive parents, who resigned themselves to the fact that my husband and I would die of cold over the winter in New York. It has since been the coziest part of our winter evenings, both on land and off. 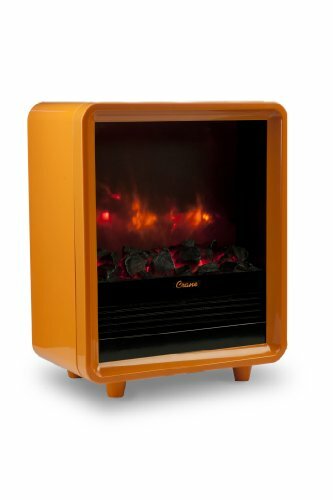 Most fake fireplaces are loud and cheesy, but this one has form, function and vintage flair. It kicks off a nice heat and cozy glow. It also barely takes up a square foot of space. You can order it in white and black too. 5. A set of unbreakable cups. We foolishly went through an entire set of Ikea glasses before deciding that we had to invest in something more sturdy. 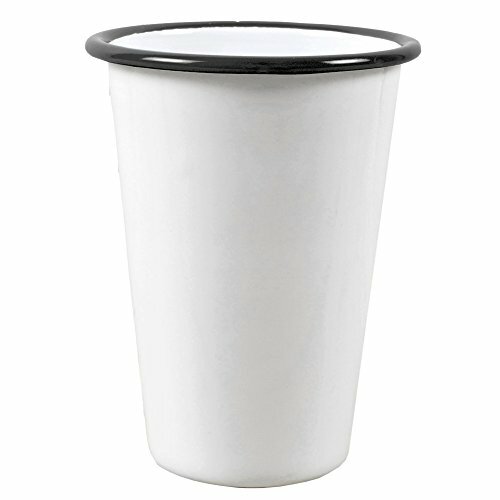 These enamel cups look great and are impossible to mess up. Even drinking red wine out of them is doable (if you forget to rinse them out, just give them a quick Clorox spritz before your normal washing.) That being said, we're still on the hunt for the perfect unbreakable wine glasses. I've seen these all over the place in difference colors and in much fancier locales since purchasing ours. We always get compliments on them when we have people over. 6. A mess-free decent coffee maker. A tip from a coffee aficionado colleague two years ago turned me onto the AeroPress and I haven't looked back when making boat coffee. 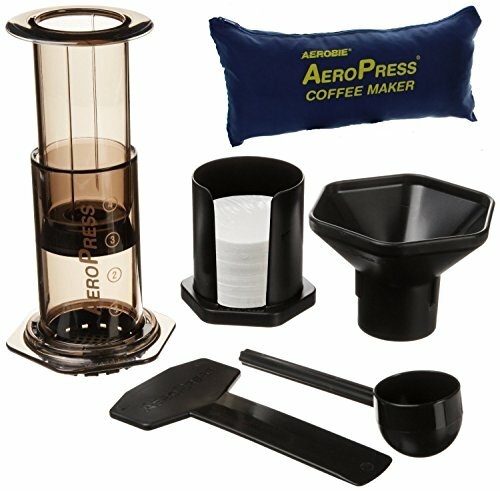 It takes about four minutes to make a super concentrated, delicious espresso or coffee with this press. It's a fun process to make a cup and the easiest clean up of any coffee maker I've used -- by the time you've squeezed out your coffee, you've already cleaned the entire device. And there's very little filter waste. So. much. better. than shoveling out the grounds of a french press into a trash bag. Ugh. The bag is cheesy but I find it makes the whole set easier to store and travel with, so I've come to like that too and would recommend just buying the whole set for the price because you end up using all of it. Stow the bag and the ugly plastic parts when you have company over and you'll show off your super cool tool that I recently spotted at a Manhattan coffee joint at a $50 markup. 7. 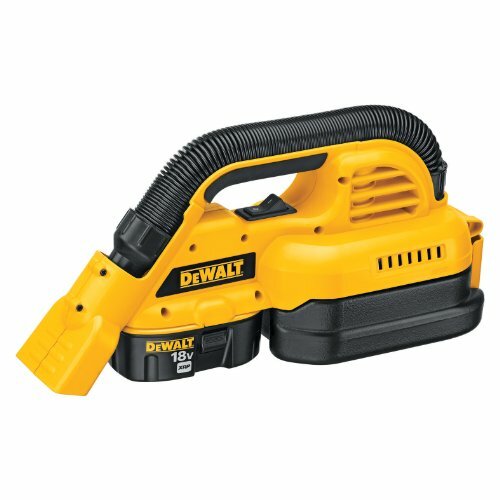 A reliable battery-charged vacuum. I was recently asked what product changed my life more than any other recently, and for the last two years, it's been this vacuum. It charges quickly, has an extendable hose, vacuums wet and dry substances, and goes after everything -- pet hair, spills, errant adhesive -- with zeal. It can handle any boat project or wayward dinner party we've thrown at it. I love this vacuum the way you love a family pet and it's small enough to stow away without a second thought. Every house, of any size, should have one of these. And the charger is the same for several of our tools, which makes it a space-saving win. 8. Bonus -- A really good stain remover. We're a wine-drinking household, which means inevitable spills. This stuff has saved our cushions four times over when we've splashed wine across our cabin -- because one spill means our entire house gets covered in wine. I live in fear of not having this at hand during a crucial spill moment. Which is why I buy two whenever I stock up. What are we missing? What can't you live without? There are great new products coming out every day for small living, so I'd love to hear your secrets. Finally, a little disclaimer and FYI: All of these products are things we love and use. If you click through on our links on Amazon, we do get a little referral tip for telling you about them.